I caught up Jeffrey Hayzlett, two weeks before his departure as Eastman Kodak Company’s energetic and boisterous, celebrity CMO (Chief Marketing Officer), at Streaming Media East 2010, where gave an opening keynote address. He discussed Kodak’s innovation in video with it’s popular pocket cameras and why companies should engage in social media and video. In his role at Kodak, he helped Eastman Kodak Company get its mojo back by using streaming media, video technology and emotional technology to connect with its customers. Hayzlett had joined Kodak in 2006 and has ran all their marketing efforts since 2009. He launched a social media team with the roles of Chief Listener and Chief Blogger, and also landed the company a starring role on NBC’s Celebrity Apprentice. Hayzlett says that in today’s media landscape, it’s vitally important to be where your customers are and that’s why Kodak has immersed itself in social media – to engage in a two-way conversation with customers. Kodak’s social media activity includes a Facebook page, four blogs, free podcasts on iTunes, videos on YouTube ad Kodak.com and very active participation on Twitter. The company turned to the wisdom of the crowd for a Twitter contest to help name their latest pocket video camera, the new PlaySport. Kodak has produced two guides with Social Media Tips and Mobile Marketing Tips to share their experiences of how social media helped grow their business, available for free at kodak.com/go/followus. How do companies get started in social media? Why do I want to participate in social media? How can social media improve my business? How will social media be incorporated into my overall customer experience? Hayzlett says that capturing that rare “Kodak Moment” and “Keep it Forever” is as simple push of the button. It doesn’t have to be a Hollywood production either, as he emphasizes, you can make mistakes and start over. Nobody cares, just get the content out there, that’s the most important thing. Hayzlett says that you’ll see more and more technology shoved into the Kodak pocket cameras. 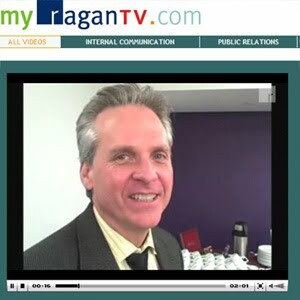 This post was originally published on Larry Kless’ Weblog: How to Produce Flip Videos that Inform, Engage and Entertain Your Employees – Update from Ragan Communications Webinar, May 14, 2010 on May 22, 2010. 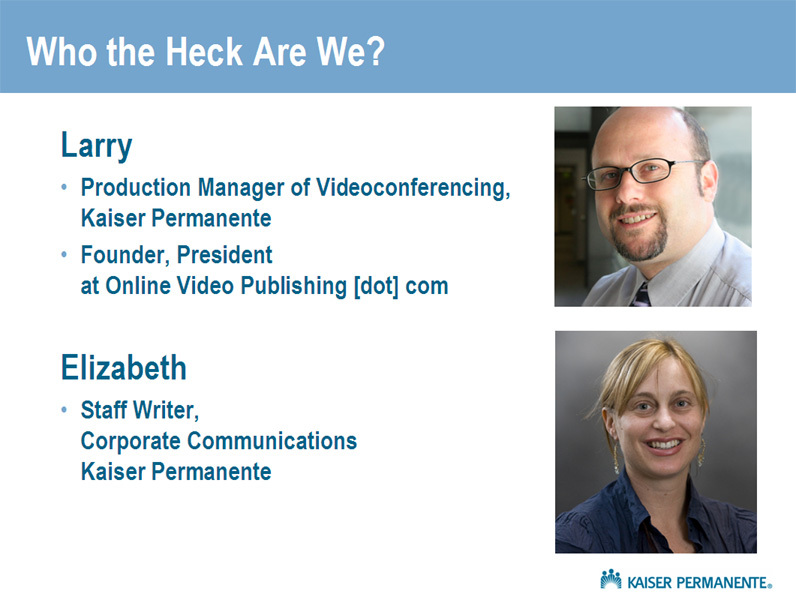 I was a featured speaker recently on a webinar hosted by Ragan Communications on, “How to produce Flip videos that inform, engage and entertain your employees.” I wore my day job hat for this event, as a multimedia professional for Kaiser Permanente, and was joined by my colleague Elizabeth Schainbaum, a staff writer in our Corporate Communications department. We discussed how we’re using Flip and Kodak pocket video cameras to capture important employee news to post on our company’s Intranet portal. Liz shared her experience as a writer turned video producer, who really hadn’t used a Flip camera before but was charged to produce a short video, rather than write a story about how one of our medical team’s from South Sacramento were conducting a trauma response training at our Sidney Garfield Health Care Innovation Center. The medical team ran a series of simulations on how to respond to gun shot wound victims and other severe injuries to prepare for the opening of Kaiser Permanente’s first Level II trauma center. Liz’s manager thought it would be a great opportunity to use video to tell the story.In preparation for the video shoot, Liz asked me for a few pointers on how to capture the story using a Flip camera. Her boss handed her a Flip without any instructions and only about a day or so to prepare. I had previously led a Flip 101 training session for some of her colleagues in Media Relations and Corporate Communications, who also were given Flip cameras as part of KP’s growing use of social media within internal and external communications. Liz and I had a brief hallway conversation, and I shared a few important tips that I thought would help her produce a better end product – such as, use a tripod or hold the camera steady, interview a few people, make sure they introduce themselves and keep their answers concise, also have them include your question in their answer for context, try to have an interesting background, stay close since the microphone is built in, shoot some B-roll so you can edit in some cut-aways, just to name a few.After her video shoot, Liz worked with one of our Sr. Web Developers to both edit the video and post it to our Intranet website. The completed video got rave reviews and she went on to produce several videos which were even better the first as she learned more and got more comfortable with the medium.It turned out to be a great case study for using video in corporate communications and a perfect fit for the Ragan webinar audience. The webinar itself was very well attended with over 200 paid attendees. You can buy the CD from Ragan for $99 here, but below you’ll find our webinar slides for free. View more presentations from Online Video Publishing [dot] com. We were also joined by CEO Mark Ragan during the Q&A, who shared some tips of his own on how you can use a Flip camera at events to record simple “man (or woman) on the street” interviews. At a recent conference in London, he shot an number interviews with attendees ad asked them all the same question, “What British communicators hate about jargon?”. He was able to get a range of spontaneous and often humorous answers. He also recorded a brief introduction of himself to give it some context, by handing the camera to the last person he interviewed, then edited it all together in Windows Movie Maker on the plane ride home. Some of they take-aways from the webinar to keep in mind are that you really have to consider have to consider your audience when you produce a video. Is your audience online or on mobile devices? Will the video play a big screen or little screen? Do you need a broadcast quality video production or will a $200 pocket video camera do the trick for you? Flip, Kodak or any other pocket video camera and cell phone cameras provide an immediacy of your subject matter. With the evolution of the UGC-generation we’ve accepted a lower quality threshold. Things that are little rough around the edges are seen as more authentic. When you’re shooting your video don’t forget to get a variety of shots as good B-roll. Anticipate any action, take charge and remove any obstructions that are in your way, rehearse your interviewees and do a couple takes. Don’t be afraid to ask them to start over if you need a shorter take or if they say too many “Umms”. If you’re using a Flip, try to use a back up audio recorder that has an external microphone. There’s a slide in the presentation with a few makes and model numbers you can try, or if you have more than one Flip, set one closer to your subject and splice the audio together when you’re editing. What’s important though, is to have a compelling story that can be told in 90 seconds or less, good audio and lighting, and a steady camera. That will help not only hold your audiences attention, but also as the title of the webinar says, inform, engage and even entertain them.